Mr. Museveni has maintained the lead in the provisional results that have so far been released with a 70.62% margin at the National Tally Centre in Namboole. Results from 12,706 polling stations out of 23,968 have been announced. Results continue trickling in and the above result will be changinging very shortly. The Chairperson of Electoral commission Eng. Badru Kiggundu has said that results for 36 districts have come in fully, partial results for 71 districts and results from 5 districts have not yet got to the tally centre. 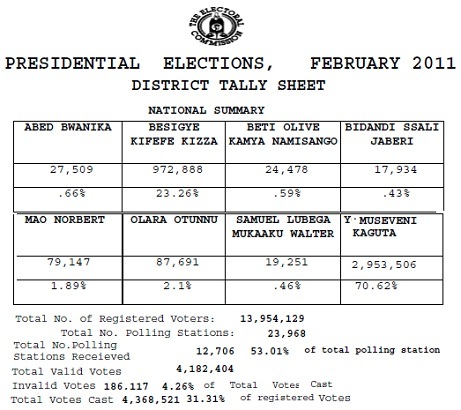 Invalid votes are 186,117 representing 4.26%. The Chaiperson is however confident they will meet the deadline to announce the winner of the presidential poll. Meanwhile, Kampala is so peaceful with almost all the offices/shops closed.